We had reached the evening of our final game drive in the Masai Mara. 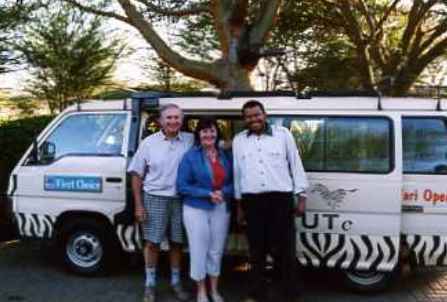 Our driver and guide, Ali, slowly circled his minibus around a group of low trees whilst urging us, his seven safari passengers, to remain as silent as possible. The minibus swayed over a hard, beaten track as we stood balanced on our seats, heads through the open roof, eyes searching scrubby bushes for signs of movement. Tension mounted in those moments. We had come so far and hoped not to be disappointed in this, our last quest. Our journey to this point had started seven days earlier in Mombasa. After a ten hour flight from London my husband, Jack, and I arrived in the humid heat of Moi airport and within a very short time we were aboard a minibus, along with five other travellers, en-route for Nairobi. The road distance from Mombasa to Nairobi is over 300 miles but our itinerary, handed to us as we left the airport, included many detours and game drives making the overall mileage considerably longer. At that point I was unaware of the amount of travelling that lay ahead for, as we left the surprisingly clean airport to drive through Mombasa, I was overwhelmed with the sights and sounds of East Africa. Mombasa is a thriving port and trading centre and Kenya’s oldest town with a history dating as far back as 500 BC. Evidence of many invaders over past centuries, including the British, is reflected in the architecture of various buildings and artefacts. The town, bustling with life and vibrant colour, is situated on an island in the Indian Ocean accessible to the mainland by car ferry. Driving through the dusty streets may come as a shock to first-time visitors as living conditions of the townspeople can only be described as squalid and poor. In a country where wages are low and unemployment is high these surroundings are to be expected but, in spite of their poor housing, the people seemed clean and well fed. I found the attraction of Mombasa to be in its pungent disarray of markets, in the colourful costumes of Kenyan women and the excitement at arriving in the vast continent that is Africa. Salt Lick Lodge, lying at the foot of the Taita Hills, is a collection of unusual, round–turreted buildings on stilts linked by wooden walkways. Ali explained that the Lodge is within the boundaries of the privately owned Hilton Wildlife Sanctuary which was once a sisal plantation but now a haven for buffalo, waterbuck, elephants, zebra and other wildlife. Enthusiasm grew amongst our party as we approached the Lodge and, although very tired, we agreed to a further two hour, early evening game drive through the sanctuary. Thoughts of weariness retreated when we were rewarded with our first sightings of gazelles, elephants and a lone giraffe feeding in the fading sunlight. Finally arriving at Salt Lick we were delighted to find that our large, round rooms overlooked a well used watering hole. On that first evening I shall never forget the thunderous sound of hundreds of hooves that sent me hurrying towards a window to see a great herd of water buffalo stampeding towards the watering place. Jostling and poking each other with their curled horns they looked like a crowd of vandals skidding to a halt in a cloud of dust as they reached the hole. Then, bending to drink, everything became peaceful. What a picture, dozens of big, black buffalo accompanied by white pelicans and snorting warthogs all beneath our bedroom window. The early hours of the following morning brought more surprises when sounds of loud trumpeting hailed the arrival of a group of elephants coming to drink at dawn. Later, lionesses lingered a short while in the rays of the rising sun while a troupe of baboons, all in line, went off under outlying shady trees to their daytime haunts. We spent just one night at Salt Lick leaving early to drive through Tsavo West National Park and journey west towards Mount Kilimanjaro. The road, as pitted and potholed as before, took us across the spectacular Shatani lava flow land, remains of molten outpourings that spilled down the slopes of the Chyulu Hills over the last three centuries. Amongst jagged, lava lumps we caught sight of two hyenas bravely dragging a dried animal skull across this unwelcoming place. Ali drove on for several hours, often describing the territory or pointing out birds and animals of interest, until we passed adjacent to the Tanzanian border. Here an armed guard joined and escorted us in case we were accosted by bandits. Eventually we arrived, safely, into Masai territory. The Masai people are a proud and beautiful tribe maintaining their nomadic traditions in spite of encouragement from the Kenyan government to modernise their way of life. 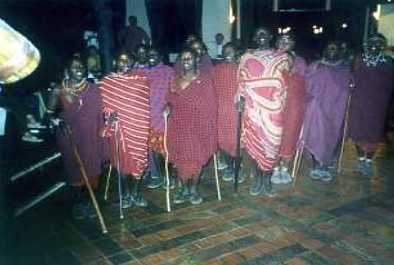 Their source of wealth is in their cattle herds, the most important factor of Masai existence. Our minibus passed many circular compounds of dung covered huts, Masai warriors tending cattle and the women, wearing endless rows of coloured beads, sometimes carrying huge bundles of sticks to build their huts. Adults and children never failed to wave and smile, hands outstretched towards us for a few coins. By lunch time we reached Ol Tukai Lodge to be greeted with “Jambo, you are welcome,” from staff ready to serve us with cool drinks. The youngest of our party, a girl of fourteen, was entranced with our surroundings which offered a substantially sized swimming pool set amongst a series of large, wooden chalets. An electric fence rings the perimeter of the Lodge to keep out animals that live within Amboseli Game Park. 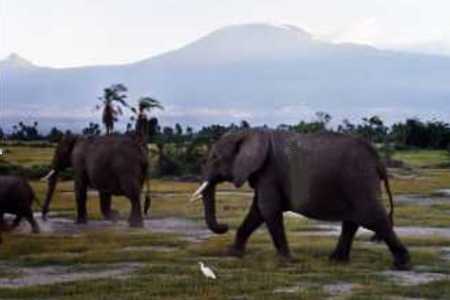 Dominating the view are the three peaks of legendary Kilimanjaro, magnificent in the rays of sunrise and sunset. No wonder Hemingway described the mountain as, “great, high and white in the sun.” Kilimanjaro is the highest mountain in Africa, based fully in Tanzania, but its awe-inspiring peaks make it just as important to the scenery and landscape in this part of Kenya. Beneath the mountain’s grandeur Amboseli, with some parts swamp land and other parts almost desert, provides a home for big game, lions and cheetahs and many beautiful and colourful birds. Ali, was quick to point out differences between Thompson gazelles, Kudu gazelles and the Bongo variety on our game drives. We were also treated to some amusing performances by lone wildebeest that seemed to sway and prance in most ungainly fashions. During our stay at the Lodge a local Masai tribesman, young, well educated and speaking excellent English, gave us a cultural talk about his tribe’s customs and way of life. We learned that the Kenyan Government employs Masai representatives in the Lodges to promote tourism. We were also entertained by a group of Masai dancers who did their jumping performance accompanied by deep, throaty chanting. Any money received from these shows is divided amongst their people to pay for education and medicines. After two glorious days exploring Amboseli we took to the road again, a happy and refreshed band, ready to head for Nairobi. The drive was extremely bumpy and tough going although Ali, clearly an expert, handled everything very safely. He said that the minibus was doubly reinforced with shock absorbers needed for negotiating safari tracks. We made our way northward, passing through a picturesque town called Namaga where cascades of bougainvillea adorned its buildings and lush, green trees were in abundance. The greenness of this part of Kenya came as a big surprise. No wonder the early colonialists made their homes in these cooler highlands near Nairobi. The scenery in this area is reminiscent of fine, sunny days in an English countryside. At last we were out of the potholes and pits onto a tarmac road leading into the city and although the road was busy and driving is on the left there seemed to be very few similarities with British driving rules. Our arrival at a tropical, treetop style restaurant built around a huge a tree was most welcome and after a fine meal and a short rest it was time for the final lap to Lake Navaisha. This journey afforded a spectacular view over the Great Rift Valley with Longonot, a dormant volcano, at centre stage. High above the Valley we left our vehicle to balance on ill-aligned boards, serving as a viewing area, above a vast panorama that stretches for miles into the distance. The view was amazing, a picture of varying shades of colour disguising the resident volcano far below. 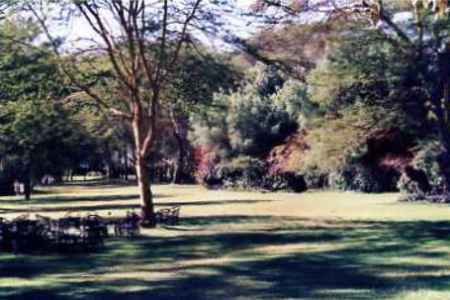 We proceeded through fertile highlands eventually arriving at the colonial style Lake Naivasha Country Club. 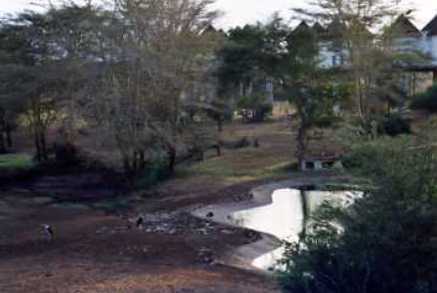 Surprise awaited us for the lawns here must be some of the greenest in the world, interspersed with elegant shrubs, all leading down to the glistening waters of Lake Naivasha, home to a multitude of different species of water birds and hippos. What a paradise! As we arrived, tired and dishevelled, waterbuck were trying to feed on the green lawns but were promptly chased off by uniformed staff with much arm waving and shouting. This seemed a full time job trying to keep the animals from feeding on the lush grass. Navaisha Country Club dates back to the 1920s when flying boats, bringing hunting parties, landed on the Lake. Traditions from those days are still in use. Afternoon tea is served every day on long, low terraces overlooking the fantastic gardens and a roaring open fire burns every evening in the fireplace of the lounge while guests enjoy after dinner liqueurs. Photos and mementos are constant reminders of a bygone age. For me, the best feature was the garden, so much like a formal English garden, complete with roses, belonging to a fine stately house. I found it unusual to be in Africa yet to sit amongst such a green and lovely setting. No visit here would be complete without a boat ride on the famous Lake. As the sun began to fade we boarded a motor boat to enjoy scenes of pelicans, ibis and fish eagles feeding in the waters as well as many other varieties of birds. Dark huddles of what looked like smooth rocks turned out to be families of hippos, some with babies clinging alongside their mothers. We viewed these creatures from a safe distance not wishing to risk our boat being overturned by one of these monsters! We spent one night at Lake Navaisha, moving on early next morning to follow the bottom of the Rift escarpment and head south east for the last lap of our journey to the Masai Mara. By now, all firm friends, our destination was to be Keekorok Lodge, set on the site of the first hunter’s camp in Masai Mara. Many Masai villages cover this region, the tribe’s original ancient homeland. Keepers of cattle, the men wear red robes and carry long sticks to herd their cows. They wander back and forth over Masai land leading their cattle to good pasture Several times our minibus stopped while these well-fed animals, with their keepers, crossed the dusty paths we were travelling. 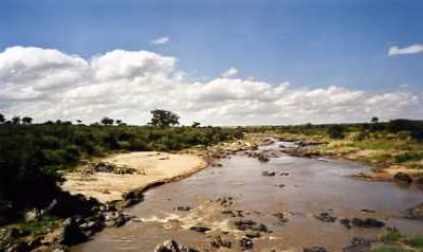 At some point on our journey we crossed the Mara River famous for huge herds of wildebeest that migrate yearly across its course, moving from Tanzania into Kenya, in search of fresh pasture. Keekorok Lodge, like the other lodges we had visited, boasts a high standard of accommodation and food. Although the Lodge was busy, being in a sought after area for watching game, we were not disappointed with the friendly service and comfort that we encountered. It was soon apparent that the main topic of conversation between tourists involved the number of “big five” that safari parties had spotted on their game drives. Driving out of the gates of the Lodge during early morning or late afternoon meant a mass exodus of minibuses. However, the vastness of the reserve soon swallowed up the vehicles and our bus was left to wander freely on paths crisscrossing over the game park. We saw some amazing sights during our travels. On one ride a pride of three lionesses with nine playful cubs between them lay dozing lazily just a few feet from our parked minibus. Then an obstinate lioness sat on the track in front of our bus and would not move for some time. Later we saw a flouncing group of young, female ostriches chaperoned by an older matriarch. A couple of black plumed males were following up behind eager to make advances to this harem of feathered beauties. Warthogs can be most amusing animals. No wonder Walt Disney’s film “The Lion King” chose an animated warthog to play a leading role. Several of these strange beasts, along with their families, could be seen ducking and diving amongst marshy grasslands along with zebra and gazelles. We came across large groups of magnificent elephants with sometimes a lone bull, with huge tusks, lurking nearby, great herds of water buffalo with curly horns who eyed us curiously as we drove amongst them. Vultures were flying somewhere in the distance and we saw hyenas, a jackal, a cheetah and dozens of different birds within a very short space of time. But everyday we searched for a sighting of a black rhino. Sadly the number of black rhinoceros in Kenya has reduced dramatically over past years. Once many herds roamed this region but hunters and poachers have decimated their population leaving, as Ali informed us, just 10 to 15 remaining rhinos on the Kenyan side of the Masai Mara game park. With this fact in mind we had very little expectation of spotting one of these rare animals. Nevertheless, when Ali began to circle a cluster of low trees urging us to keep silent, all eyes were fixed, searching for our elusive quarry. Tension was high. After spending almost a week together, aiming towards this culmination of our safari, we were anxious to catch a glimpse of a black rhino. Suddenly one hand, belonging to a young woman in our party with impeccable eyesight, waved towards the trees. No words were spoken but cameras clicked wildly. Emotion was overwhelming. Still we stayed silent. There, mostly hidden by the screen of trees, was the long horn, tiny eyes and distinct form of a rhino peering out and beside this apparition the rump of another. So fleeting was the sighting that it could have been imagination but our film shots proved that these rhinos do exist. Everyone in out party had managed to take photographs of that memorable moment. Next day, Ali, our wonderful safari driver and guide, drove us to Nairobi airport for a flight back to Mombasa. Magical memories of our trip to Kenya will always remain. If you enjoyed reading the above article then you will probably also enjoy Normandy by Maureen Wright, and Namibia, also in Africa, and our latest articles covering the Orinoco Delta, La Mata, Marbella and Beijing.